S-Quark. Photo: Bassam Al Zoghby. Festival opening. Photo: Bassam Al Zoghby. With the fall of the Mubarak regime in 2011, the CIFET, like many of the institutions established under that regime, disappeared, and an event of this sort would have been unthinkable in the turbulent years which followed. 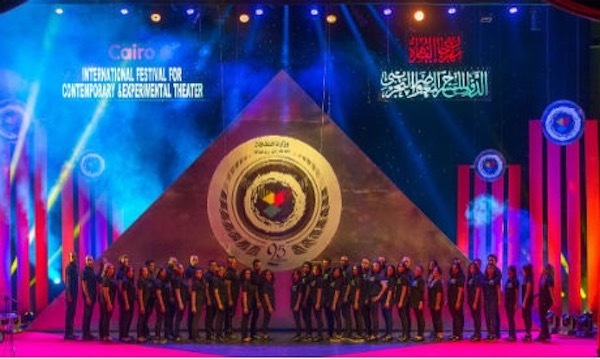 In 2014, however, with the return of stability to the nation, the theatre community, under the leadership of Gaber Asfour, the new Minister of Culture, and their many supporters elsewhere in the Arab world and beyond, began to appeal to the new regime for a re-establishment of this important cultural event. Negotiations were long delayed over the name, the new regime being opposed openly to its associations with the Mubarak era and much less openly to the festival’s association with freedom of artistic expression. At last a compromise was reached by the addition of a new word to the title, “Contemporary” and by official acknowledgement that this was a continuation, but a “revised” one, of the original festival. The phrase “free play of passions and the imagination” disappeared from the goals, to be replaced by the rather more innocuous “to broaden the space for mutual understanding” and to “introduce the latest developments in the international theatre scene to Egyptian and Arab audiences.” The revised CIFCET was officially established by the Minister in November of 2014, with an executive board consisting of Hazem Azmi, Dina Amin, Nasser Abdel-Moneim and Abul-Ela Al-Salamoni, headed by Sameh Mahran. The first revised festival was announced for November of 2015, but the proposed budget to support visiting companies was never approved. Asfour was removed from office this spring and his successor showed little interest in the project. 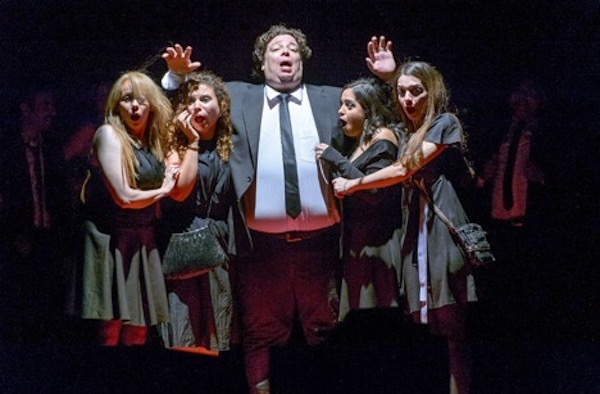 The theatre community and the ITI continued to protest, and at last a new minister of culture, Helmi Al-Namnam, in mid-September created a fund to support the festival and made it a semi-independent ongoing entity within the Ministry, similar to the Opera. The funds were to be devoted to accommodation, subsistence, and local transportation, but not, as was hoped, for travel or production expenses. The new festival was much less ambitious than the old, which often presented over fifty foreign shows, while the first reorganized festival presented only fifteen, along with an almost equal number of Egyptian productions. Another important change was that the festival no longer presented awards, eliminating the sense of competition. A series of colloquia and guest speakers was added along with workshops for younger artists, providing a number of new dimensions to the festival. In this new form the revised festival was launched in September of 2016. The funding has not significantly increased, but the festival has continued to expand in the number of related activities and in the number and range of participating countries. There were twenty productions in 2017 and twenty-five this year. The proportion remained similar, with seven productions from Egypt, ten from elsewhere in the Arab world and eight other international offerings, ranging from Brazil to China. The United States, represented by three productions in 2017, had no entries in the actual festival this year, but this loss was compensated for by a much admired official opening ceremony that was a new work by the American experimental company Mummenschanz. Their You and Me presented an hour and a half of quasi-invisible performers bringing life to inanimate draperies and familiar objects like violins which suddenly appeared in fascinating anthropomorphic configurations. Mummenschanz’s You and Me. Photo: Harris Center. 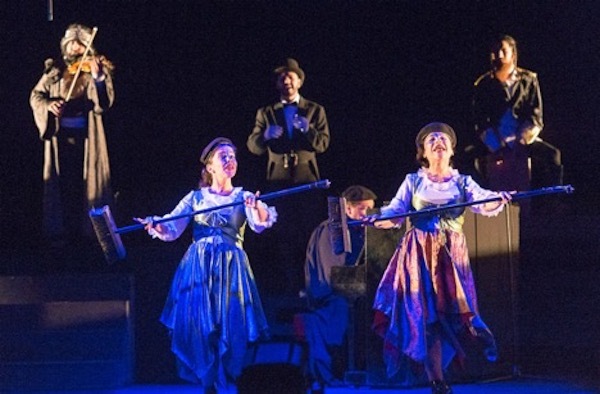 Although there is no longer an official competition, many viewers felt that the most impressive production of the Festival was Sin pies ni cabeza by the Mexican playwright Jaime Chabaud. The Spanish title literally means “without feet or a head” suggesting something totally absurd. Three enormously talented and versatile Spanish actors, headed by the director, Qui Lan Latino Latino, combined both of these meanings in their performance. In a style faintly reminiscent of comic books or gangster movies of the 1950s the three, never stepping off of a small square wooden platform barely large enough to hold all of them, enact a complex tale of action, adventure and intrigue. In a universe composed entirely of body parts, the evil Lord Head has seized power and maintains it by drinking the brains of others. Three rebel outsiders—Klap, Zlot, and Sock—conspire to overthrow the tyrant and destroy him by feeding him aspirin. 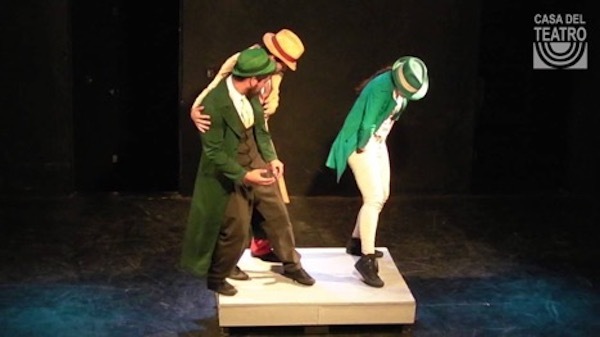 Their mission is opposed by Head’s hencemen, Eyes, Ears, Nose and Hands, and the conflicts and pursuit of these various characters make up the action of the play. Romantic interest is added by the seductive Legs, a barmaid who falls in love with Zlot and joins the finally successful rebels. All ten characters are played by the ingenious actors in a frantic display of comic invention and exuberance, in a production that left the audience exhausted and delighted. Sin pies ni cabeza. Photo: Casa del Teatro. 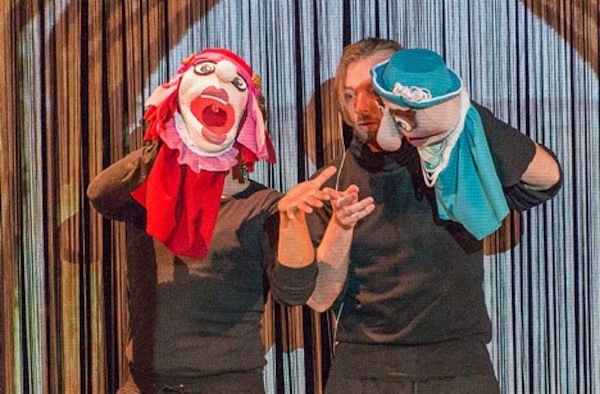 Probably the other most popular production of the Festival was Expedition Pacific by the Brazilian company Cia Truks, founded in 1990 and dedicated to socially relevant puppet and children’s theatre productions that it describes as modern Morality Plays. 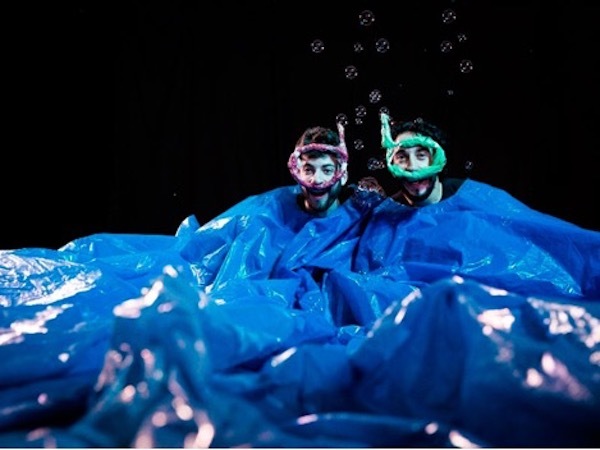 The play is performed in silence by two men, who appear in a stage heaped with multi-colored plastic bags and begin the apparently hopeless task of clearing away this rubbish. In vain they try to use the trash to build an alternative universe, but their seagulls, chickens, fish, and ballerinas, ingenious in construction and often beautiful to observe, all proof both lifeless themselves and unable to sustain life. A small white bird falls into the plastic sea and emerges coated in black. The blue sea itself turns black as the performers silently pull one large plastic sheet over another. The audience was dazzled by the inventiveness and the visual imagination of the two clowns in working with this unpromising material, but the ultimate message was a chillingly grim one—the inundation and poisoning of life by this colorful plastic. Expedition Pacific. Photo: Alberto Rocha. 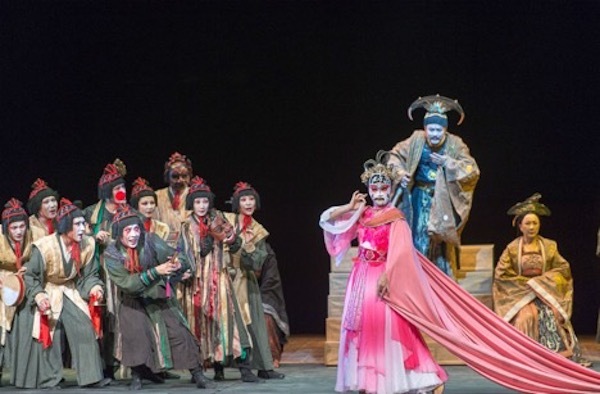 Among the other non-Arab performances much praise was given to Prince of Lanling, presented by the National Theatre of China, directed by Wang Xiaoying. The performance combined traditional Chinese opera elements with modern story-telling to present the story of a Chinese prince born with effeminate features, who wears a fearful golden mask to appear a great warrior. Gradually the wearing of the mask in fact transforms the young man into a fearful tyrant. Rich elegant costumes and effective mood lighting moving gradually from clear white illumination to a blood red pool of destruction, distinctly added to the impact of the work. Prince of Lanling. Photo: Bassam Al Zoghby. The other non-Arab offerings distinctly favored dance and puppetry over traditional dramatic action. These included S-Quark from Russia, a dance piece by the Stas Namin Theatre of Music and drama bringing to stage life the avant-garde aesthetic of the 1931 painting Fragile by the experimental artist Wassily Kandinsky, Wonder, by the Fingers Theatre of Georgia, which ingeniously presented examples of a variety of ethnic dances performed by appropriately dressed fingers and Tuba Dei and the Angels by the Imagination Strange Company of Poland, a charming piece for hand puppets manipulated through a hanging curtain and presenting a medieval Polish folk tale. Wonder. Photo: Fingers Theatre of Georgia. Tuba Dei and the Angels. Photo: Bassam Al Zoghby. The non-Egyptian Arabic world was represented by productions from Tunisia, Morocco, The United Arab Emerites, Iraq, Palestine, Syria, Kuwait and Jordan. These were on the whole a much darker collection than the more global pieces, most dealing with the ongoing internal political tensions and the external refugee crisis that affects most of the Arab world. Particularly powerful was the most recent work, Violence(s), by one of the leading contemporary Arab dramatists, Jalila Baccar of Tunisia. 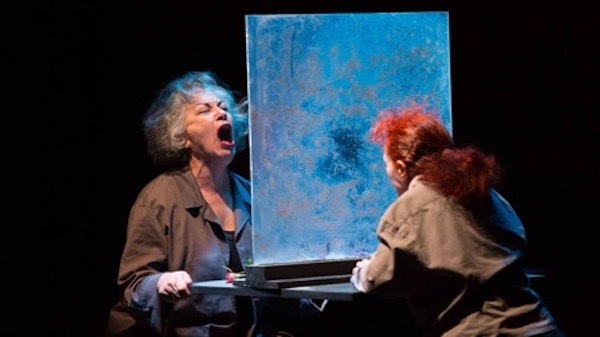 Her disturbing series of depictions of suffering under a repressive government was seen last year at the Carthage Festival and remains one of the most disturbing recent works from this part of the world. Violence(s). Photo: National Theatre of Tunisia. The other most discussed Arab production was The Smell of War by the National Group for Acting from Iraq. The play, based on the Palestinian novel Confusing the Stork, explores themes of terrorism, death, war, and extremism portrayed through three characters, two grandparents and a grandson, who perform in a kind of cell furnished only with three mirror-like openings where they enact grim rituals suggestive of Beckett’s Endgame in front of a montage of images of war, suffering and death. In the final scene, images of thousands of storks are showing flying to escape, a hopeful or less than hopeful image if one equates them with the rootless refugees now escaping from this unhappy country. Smell of War. Photo: Adel Sabri. Two of the Arab plays effectively used narrative and story-telling techniques. Third year students of the Freedom Theatre School gathered stories of displaced persons from Jenin and elsewhere in Return to Palestine and presented them crowded into a small space—“as small as Palestine.” The Female National Theatre of Syria offered in Hunna the stories of five women from different social classes in Damascus who have lost their husbands to war. 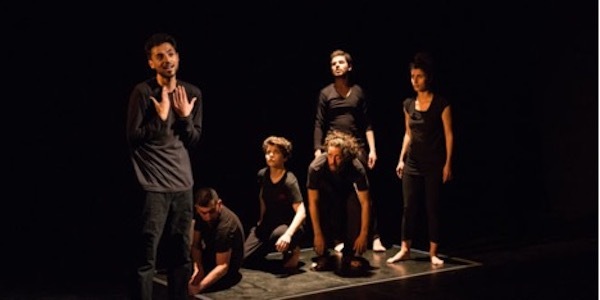 Other productions included a reworking of Mamdouh Edwan’ s Hamlet Wakes Up Late by the Stage on Wood Company of Jordan, a powerful rendition of Genet’s The Maids from Morocco and two studies of romantic affairs fallen victim to war—The Echo of Silence by the Kuwaiti National Theatre and Lilac Doha from the United Arab Emirates. Return to Palestine. Photo: Freedom Theatre. Hamlet Wakes Up Late. Photo: Bassam Al Zoghby. The Maids. Photo: Adel Sabri. Most of the Egyptian plays were already familiar revivals and former prize winners and so attracted less attention than the visiting productions. Clearly the most popular local offering was a revival of one of Cairo’s biggest successes of recent years: Khaled Galal ‘s Black Coffee made its debut in 2008, a graduation project from the second Actor’s Studio at the Creativity Centre in Cairo. It was a major success at the Cairo International Festival that year and went on to further fame on TV, with many of its cast members, such as Mohamed Farrag, Amir Salah Eldin, Hisham Ismael, and Hossam Dagher moving on to become very successful in the mainstream TV and film scene. 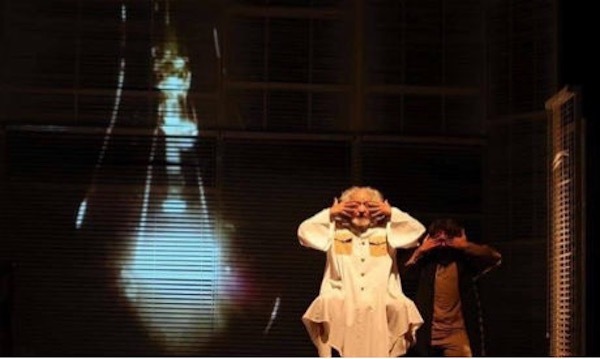 These now well-know stars returned to recreate their original roles in the play that revealed them and left a memorable mark on the contemporary theatre scene in Egypt. The show consists of a sequence of separate scenes that aim to find “reconciliations” to many of the important current social conflicts—generational, economic, and gender based. 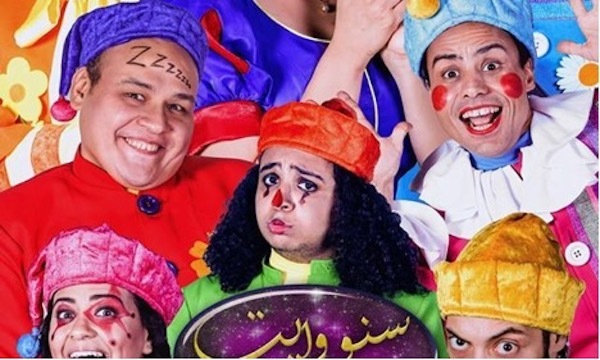 Another popular Egyptian offering was Snow White, clown shown strongly suggestive of the British pantomime tradition, directed and written by Mohsen Rizk. 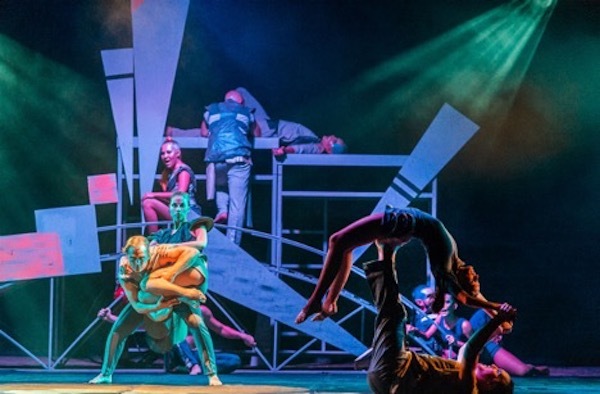 It recently received the Best Theatrical Play Award at the National Theatre Festival. 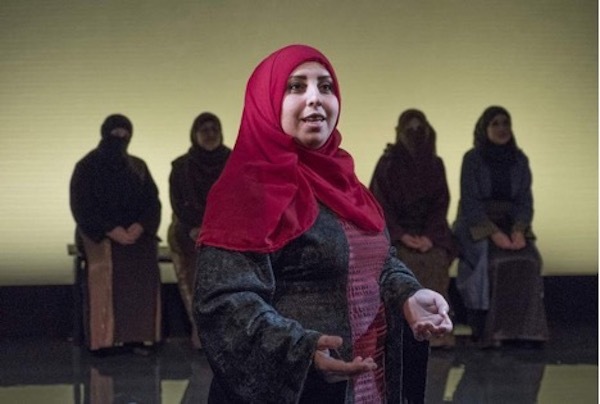 Other recent award winning Egyptian plays presented were My Aunt Safia, The Monastery, and Talk in Secret. Black Coffee. Photo: Bassam Al Zoghby. Snow White. Photo: Egypt Today. The main focus, however, remained, appropriately, on the impressive selection of foreign contributions, from the Arab world and elsewhere. The limited resources of the Festival were to some extent reflected in the size and number of the offerings, but the best easily compensated for their modest size by their skill and imagination, and truly elevated this Festival to significant international importance.